Bulgaria's prominent conductor Miroslav Popsavov and his choir perform some of the best and most popular liturgical chants by Dobri Hristov. The programme impresses with the selection and order of songs. 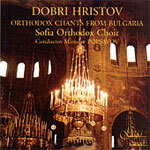 One can listen to Vespers Liturgy, created between 1936 and 1938, which, according to specialists, is the only liturgical cycle composed by a Bulgarian author. It includes chants on the unchangeable texts of the whole liturgical annual cycle. From a musical point of view, Dobri Hristov has remained faithful to the national church and choral tradition and at the same time has introduced some elements of secular music in the melody and harmonic organization of the works. His compositions are characterized by their beautifully shaped and trailing melodies, embellished with good taste, and featuring a clear and orderly harmonic structure. Most of the songs in the cycle are tender and romantic, with moments of enlightenment and devotion to prayer. The culminations are full of pathos and severity. The release also includes four remarkable songs in Orthodox Liturgy, some of them marking the beginning and final years of the composer's creative path. With its characteristic liturgical works presented in a refined and elegant manner, the CD will be of interest both to lovers of Orthodox liturgical music, as well as to specialists. It also gives an opportunity to the listener to get acquainted with this specific part of the great composer's artistic talent. 1 Troparion of Resurrection and Verses 2'07"
4 Blessed is the Man (Blazhen mouzh) 4'44"
5 O Gladsome Radiance (Svete tihii) 2'37"
6 Lord, Now Lettest Thou Depart (Nine otpushtaeshi) 3'38"
7 Troparion of the Succession of Our Lady 1'22"
10 Great Doxology (Veliko slavslovie) 10'12"
11 In Thy Kindgom (Vo tsarsvii Tvoem) 2'30"
12 Holy Lord (Svyatii Bozhe) (Varna) 2'56"
13 Cherubic Song No. 4 (Herouvimska pesen No. 4) 7'46"
14 Litany of Supplication (Prositelna ektenia) 5'20"
15 Our Father No. 2 (Otche nash No. 2) 3'15"